Tax free, income tax medical deduction. Shroudless design offers easy access to internal components and batteries. Semi-reclining seat with adjustable headrest offers three height adjustments and two depth options. Available with 18" or 20" width Captain's Seat. Quick-release pins allow easy seat removal. 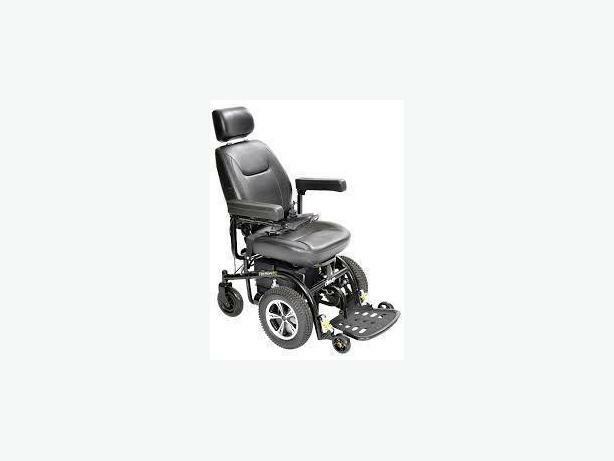 Adjustable, flip-up footplate includes rubber front bumper to prevent damage. Optional swing-away controller arm sold separately. Optional elevating leg rests sold separately. Controller is protected by metal frame. We have tires and batteries for you scooter and power chair. We carry mobility devices such as canes, crutches, walkers, rollators, wheelchairs, transport chairs, scooters, power-chairs and accessories such as lift chairs, cushions, back support, compression socks. We also have bath safety equipment such as bathtub mats, grab-bars, raised toilet seats, transfer benches and bath seats. We sell new, used and rent. We deal with DVA, ICBC, Blue Cross and private insurance companies.